Some of the field hockey players running a 5k for pediatric cancer. As the many people know, October is cancer awareness month. A lot of the sports teams do an amazing job at raising awareness for various types of cancer. From bake sales, to t shirts, to speeches on the field, every bit of awareness is appreciated. The girl’s volleyball had their breast cancer awareness game on September 28th and it was a success according to junior Coco Jepsen. All the girls wore pink spandex as part of their uniforms and the parents helped to run a bake sale to raise money They also had a car wash that all the proceeds went to St. Jude’s Children’s Cancer Research Center. According to Willy Keating, senior captain, the football team can be seen all of October sporting their new pink socks, gloves, mouth guards, towels, tape, etc. to show their support for all affected by breast cancer. 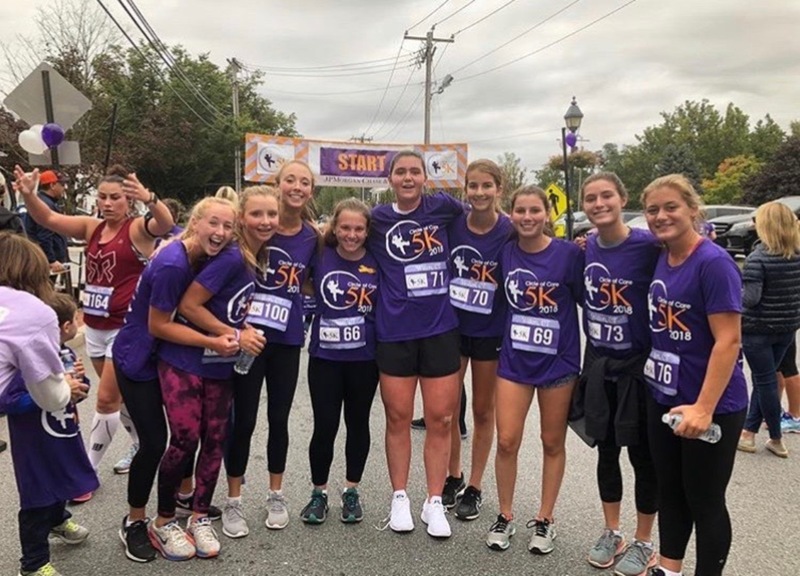 Katie Elders, senior captain, says that, in the past the field hockey team has done “Play for the Cure” to support breast cancer awareness, but they decided to switch it up last year and support pediatric cancer. Many of the girls on the team ran the Circle of Care 5k to support pediatric cancer. They are also trying to get a breast cancer awareness “Play for the Cure” game, like they have in years past. The girls soccer team celebrating a goal during the breast cancer awareness game (courtesy of DAF). The girls swim team is also trying to raise breast cancer awareness according to junior, Grace Berry. She said that the day of one of their swim meets they will all be wearing pink to school, and will dedicate that meet to all affected by breast cancer. The cheerleaders can be seen at the football games with pink bows and pom poms during the month of October as a way to show their support for those affected by breast cancer. 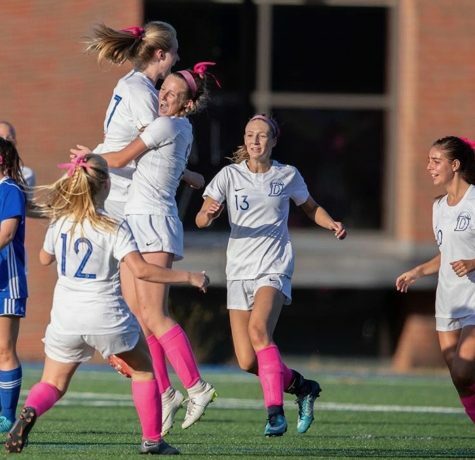 According to senior captain, Eva Finn, the girls soccer team had their “Play for Pink” game where all the players wore pink socks, headbands, and ribbons. They were seen wearing these to school and also for the duration of their game. Their coaches also took part in this by wearing pink “Wave Soccer” t shirts. They had a bake sale and car wash to raise money for the Bennett Cancer Center as well. Siddhant Parwal, senior, stated that the boys soccer team dedicated one of their games to cancer awareness and held a bake sale at that game where all the proceeds were donated. Everything from small touches of pink, car washes, bake sales, and 5k’s show how much all our sports teams at DHS care!